The introduction of tariffs on aluminum and steel by the US government in 2018 set off a trade war with China that has been escalating through tariffs on more and more goods introduced by both parties. At the same time, China has been gradually implementing a ban on importing scrap and waste of metal, paper, and plastic, with a target to have a complete ban by 2021. These developments could have a major impact on maritime activity. However, as things stand there is uncertainty over the extend of any impact. At ClipperMaritime, we have invested significantly in our data sets, which gives us a global understanding of trade flows and maritime movements. 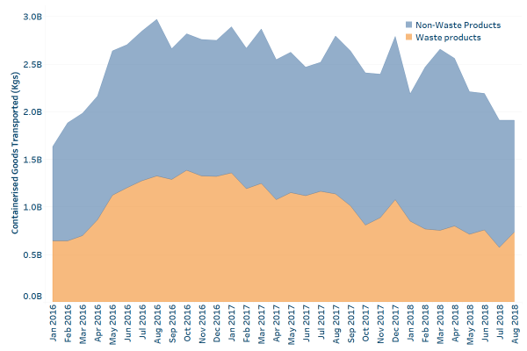 Our analysis of this data suggests that the trade war may not yet be biting in the container markets, and the scrap ban has resulted in significant changes to the structure of the global scrap trade. Despite the active and impending tariffs, containerized exports from China to USA continue to grow, while exports from USA to China show a decline after the Chinese tariffs introduced in April. The structure of the scrap trade from the US is changing, with a massive decline in exports to China. Indonesia and India in particular are taking on market share. All data presented in this report is available on an ongoing basis through our interactive dashboard tool: get in touch with one of our team to explore further. The export of containerized goods from China to the US has been increasing steadily, with no sign of slowing down after the US tariffs came in effect. The first round of tariffs, which were focused on bulk transport of iron and steel, did not particularly affect containerized goods. Later tariffs, including those that came in to force in June, had a broader remit and covered products that would likely be containerized, such as machine parts and tools. Our latest data, for July, shows growth in containerized traffic between July and June for 2018 to be similar to that experienced in previous years. It may be that we may see some impact as existing orders are fulfilled and new manufacturing sets up elsewhere, but as things stand it appears the trade war is not affecting flows from China to the US. Figures 2 and 3 show that the container ship capacity deployed between the US and China has not yet been affected by the trade war. In fact, capacity deployed has been growing strongly and seems to have accelerated in 2018. This follows our analysis of demand, which is continuing to grow from China to the US. This shows that the trade war has not affected the major shipping lines’ commitment to the China – US trade lane. On the other hand, the TEU flow from the US to China has been declining since mid-2017. The decline has accelerated in 2018. There are three potential drivers: the trade war tariffs directly – and especially the Chinese tariffs imposed on April, the trade war tariffs indirectly through the appreciation of the US$ against RMB, and the gradual implementation of the Chinese ban on importing waste products. Figure 4 shows the majority of the decline in containerized goods has been from scrap products, with the total flow of non-scrap products remaining largely consistent year on year up to July. However, our latest data from August shows a drop of 30% compared to August 2017. This could be a sign of the trade war biting for US exporters. Figures 5 and 6 show the significant decrease in scrap exports from the US to China. The Chinese ban on importing waste has resulted in a 35% decrease on the imports of these products – a reduction of over 3 million tonnes. This has inevitably led USA to redirect its waste exports, mainly towards India, Indonesia, Vietnam, and Thailand. Given that shift and the fact that some ports in the USA are more well-connected with the new destinations of the waste exports, significant changes can be observed in the volumes exported on the top 15 ports in the USA. The ports that seem to be hit most by the Chinese waste import ban are Mobile, Tampa, and Philadelphia, while Los Angeles, New York City, and San Francisco are among those that have seen growth from new regions. With the major decline in scrap exports to China, and the significant year on year decline in non-scrap exports to China seen in August 2018, the US may be starting to see the first signs of struggle in the trade war.